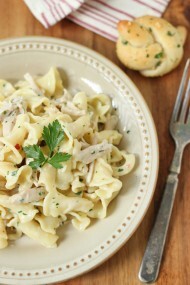 Chicken Alfredo with pasta and vegetable is a favorite in my family. 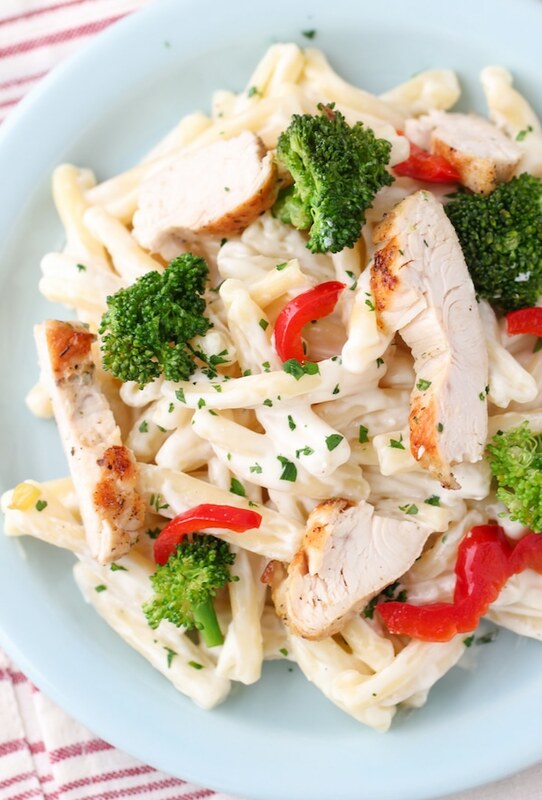 The rich, luxurious and flavorful alfredo sauce coats the pasta, with juicy morsels of chicken and crisp broccoli and peppers. Both my siblings and Sergi’s siblings absolutely rave about it. They request this more often than any other dish. One of my brother in laws could probably drink the Alfredo sauce and forego the pasta and “trimmings” altogether. 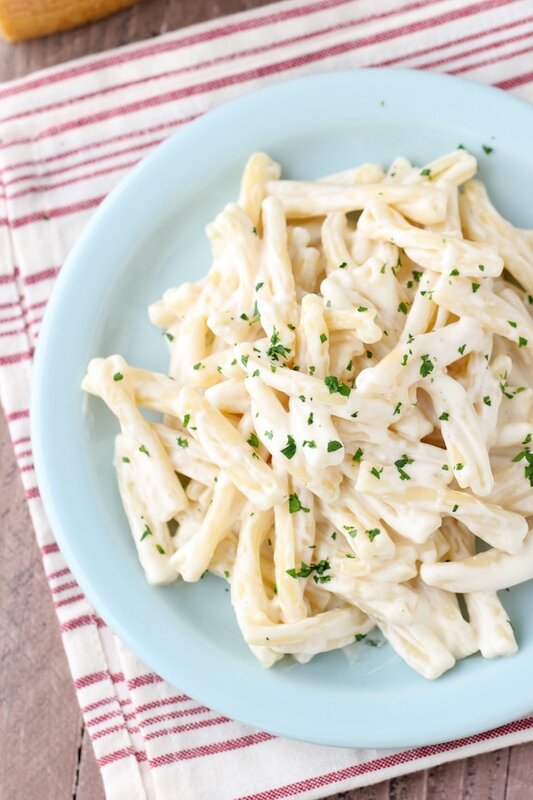 Alfredo is a cream sauce with Parmesan cheese. 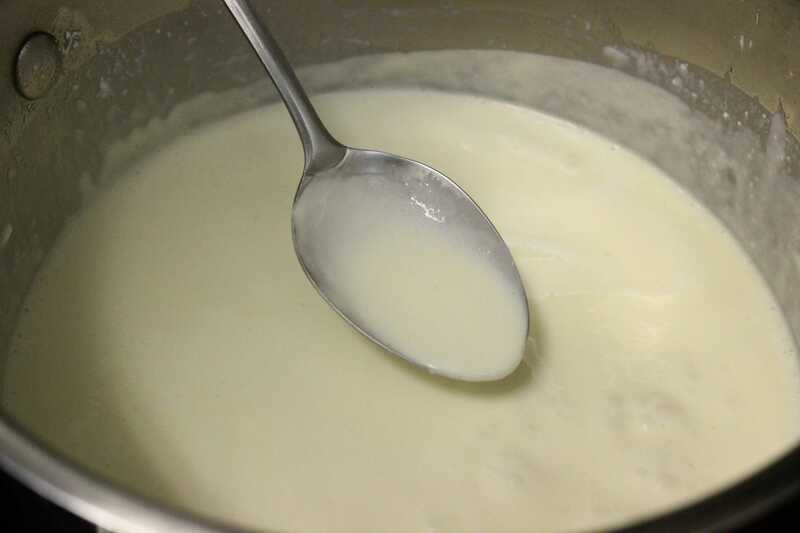 This silky, creamy cheese sauce is a popular Italian dish, served as a sauce with pasta and often as a dipping sauce too. 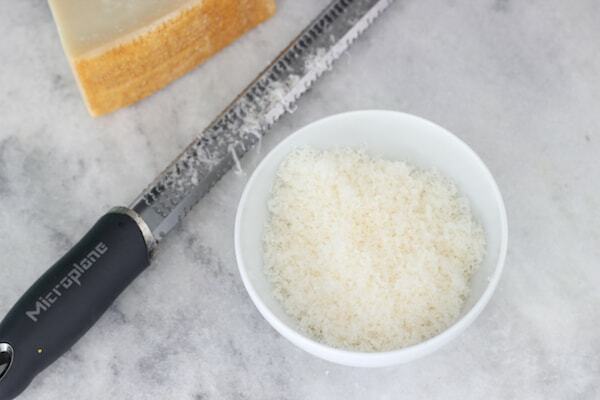 Traditionally, Alfredo is made strictly with cream and Parmesan. It tastes great, of course, but the problem with this sauce is that it congeals very quickly and doesn’t reheat very well. Basically, you’d better be making the sauce as you portion out the pasta and have everyone at the table waiting to eat. Right away. 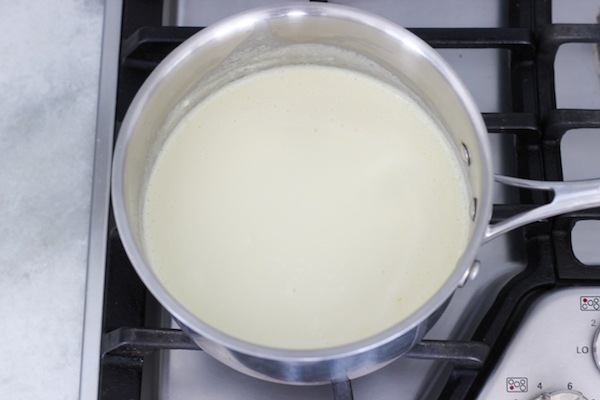 This modified version of Alfredo sauce has a bit of cream cheese, which keeps the luxurious texture of the sauce but also stabilizes it so you have a bit of leeway. Keep the sauce in the warm saucepan and you can gently warm it up on low heat if you have to. I wouldn’t recommend reheating it the next day, but you can easily reheat it within a few hours and the sauce will still be just as smooth and silky. 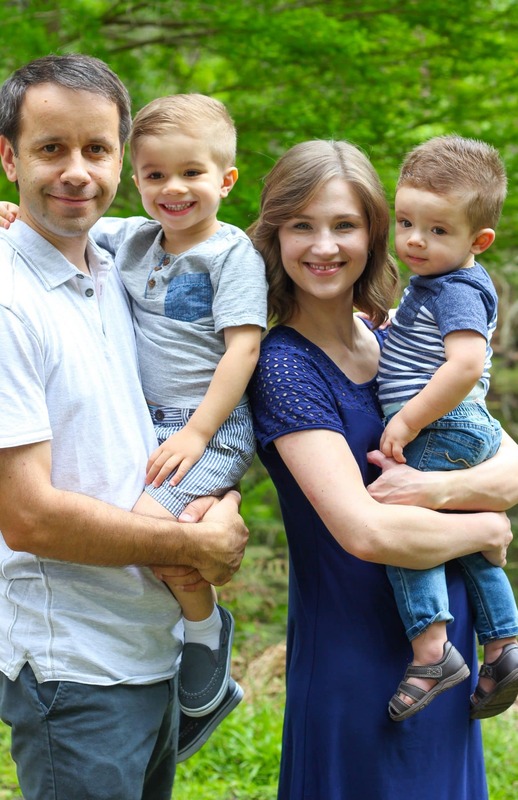 If you have family members who will be eating dinner later than the rest of the family, they can still enjoy it just as much. This also means that it’s a perfect dish to serve guests. Even if dinner runs a little bit later than planned, you’ll have no worries, because every part of this meal will stay perfect until ready to be served. Prep all your ingredients first. 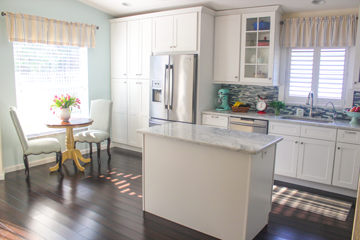 It makes the time you spend in the kitchen so much easier. Put a pot of water on to boil for the pasta and cook it according to how you like your pasta, al dente, firm or soft. Meanwhile, cut the broccoli into florets. Julienne the bell pepper. Season the chicken breast with salt and ground black pepper. 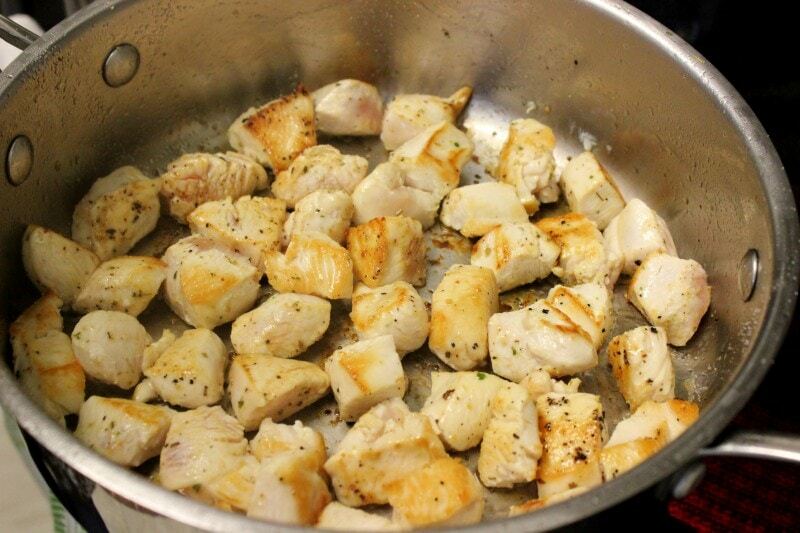 I will often sprinkle some dry herbs and my favorite chicken seasoning mix on top of the chicken for extra flavor. Heat about 1 Tablespoon of oil in a large skillet on high heat. When the skillet is hot, add the chicken. The chicken will easily turn over when it’s nice and golden. If you try flipping it when it’s not browned yet, it will stick to the skillet and tear if you try to force it, so resist the urge. Cook for about 5 minutes over medium high heat, then turn the chicken over, lower the heat to medium-low, cover the skillet and cook until the chicken is cooked through. 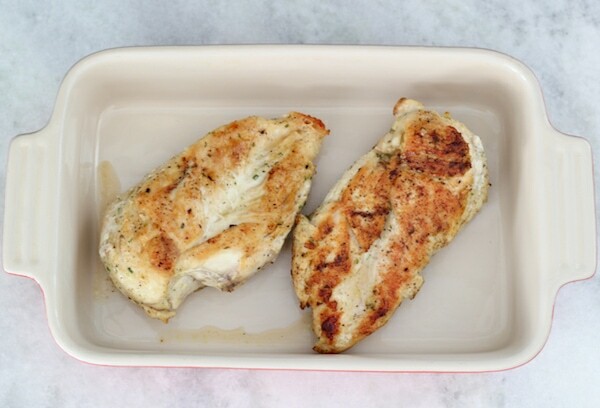 You can also cut the chicken into about 1 inch pieces and brown it in a skillet. Set the chicken aside and cover to keep it warm. 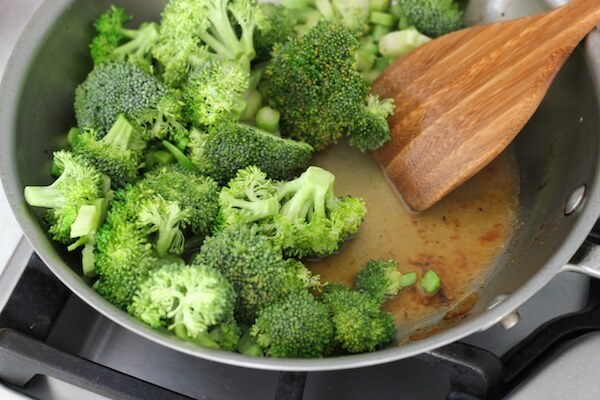 In the same skillet, add about 1/2 – 1 Tablespoon oil, turn the heat to medium and add the broccoli. Cook for about 3 minutes and then add the bell pepper, cooking for another minute, then pour in about 1/4 – 1/3 cup water. Scrape the bottom of the skillet to deglaze the skillet. Season with salt and pepper. 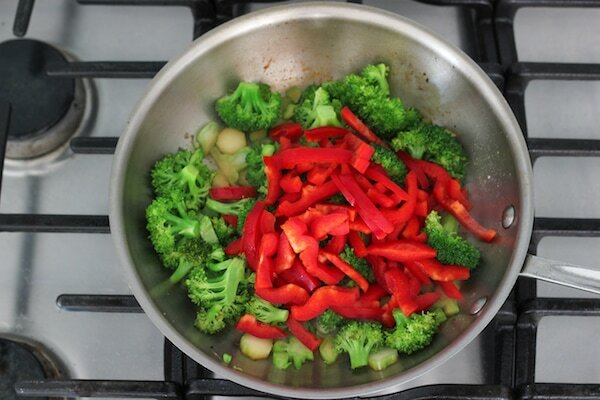 Cover the skillet, turn the heat down to low and cook until the broccoli and peppers are as tender as you like them. 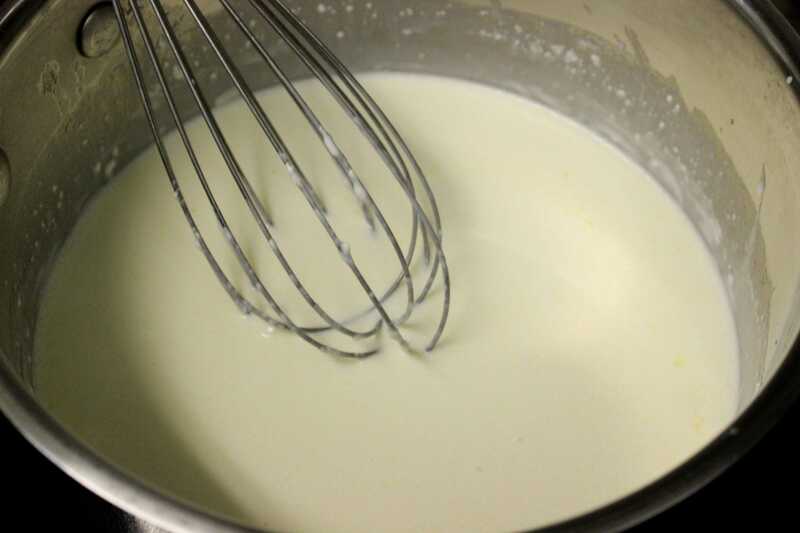 For the sauce, combine the butter, cream cheese and heavy cream in a medium pot. 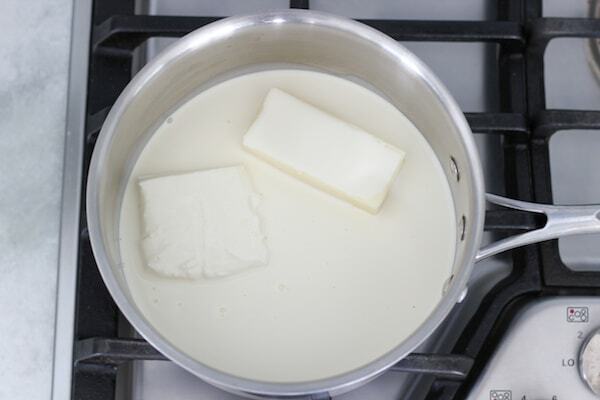 Cook on medium heat until the butter and cream cheese are melted and the sauce has an even consistency. 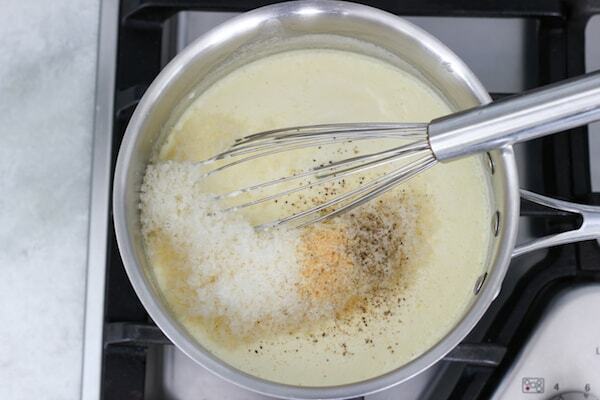 Add the Parmesan cheese and whisk until it melts too. I also like to add some garlic powder and ground black pepper for extra flavor. Season with salt, if it needs it. Toss the pasta with the sauce. Add some of the pasta water if you want to thin out the sauce. 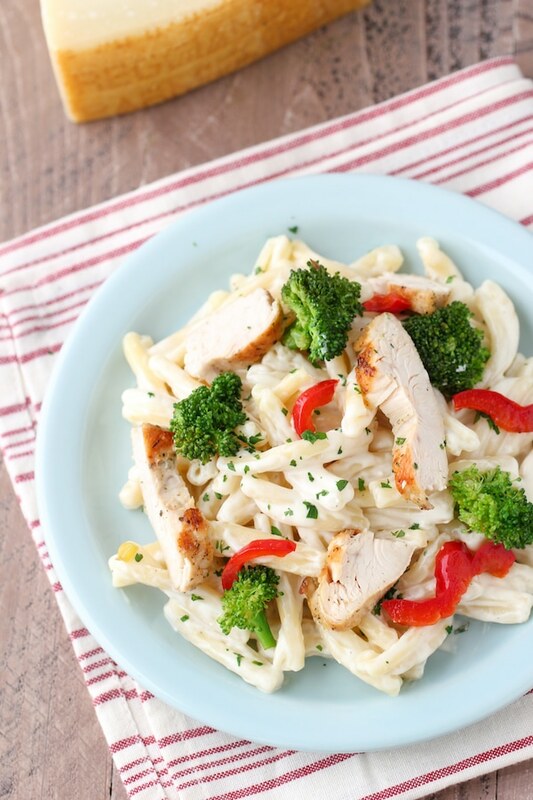 Cut the chicken into strips and serve with the broccoli and peppers over the pasta. You can also use any kind of vegetables that you like, spinach, kale, carrots, zucchini, asparagus, cauliflower, green beans, etc. 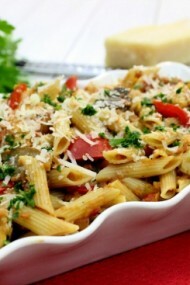 Garnish with more Parmesan cheese and fresh minced parsley. Prep all your ingredients first. 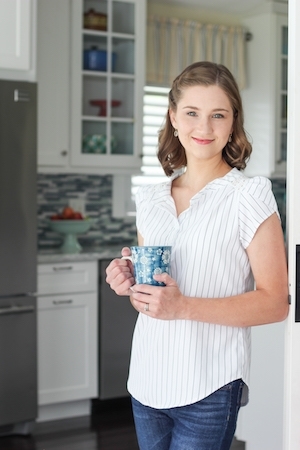 It makes the time you spend in the kitchen so much easier. Put a pot of water on to boil for the pasta and cook it according to how you like your pasta, al dente, firm or soft. Meanwhile, cut the broccoli into florets. Heat about 1 Tablespoon of oil in a large skillet over high heat. When the skillet is hot, add the chicken. The chicken will easily turn over when it's nice and golden. If you try flipping it when it's not browned yet, it will stick to the skillet and tear if you try to force it, so resist the urge. Cook for about 5 minutes over medium-high heat, then turn the chicken over, lower the heat to medium-low, cover the skillet and cook until the chicken is cooked through. 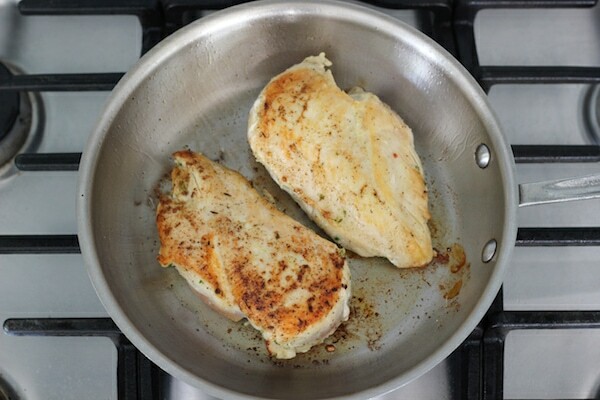 You can also cut the chicken into about 1-inch pieces and brown it in a skillet. Set the chicken aside and cover to keep it warm. 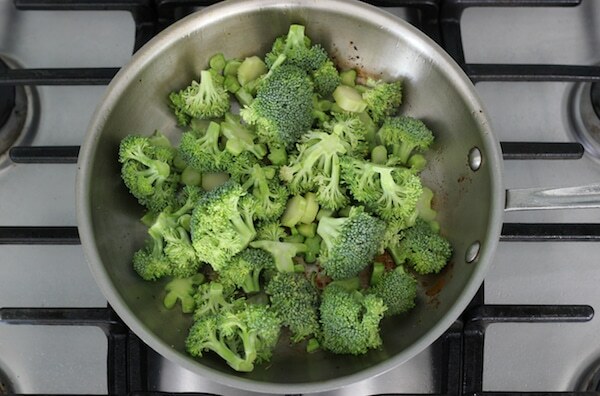 In the same skillet, add about ½ - 1 Tablespoon oil, turn the heat to medium and add the broccoli. 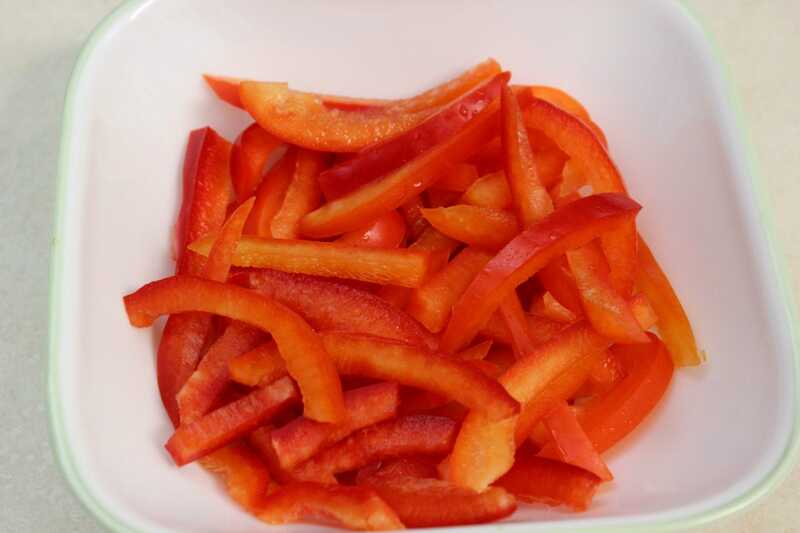 Cook for about 3 minutes and then add the bell pepper, cooking for another minute, then pour in about ¼ - ⅓ cup water. Scrape the bottom of the skillet to deglaze the skillet. Season with salt and pepper. Cover the skillet, turn the heat down to low and cook until the broccoli and peppers are as tender as you like them. 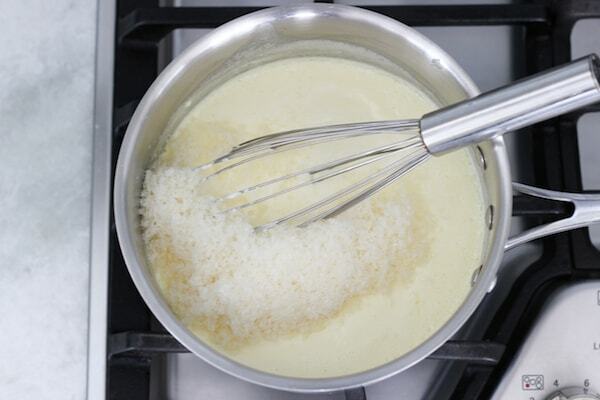 Add the Parmesan cheese and whisk until it melts too. Season with a bit of salt and pepper. I also like to add some garlic powder for extra flavor. Amazing! 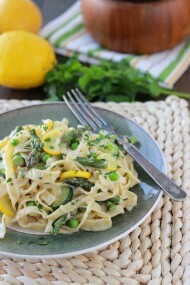 My new favorite alfredo dish! Beautiful dish!!! So easy to make!! I like adding mushrooms to different dishes too! You’re right, this dish IS so versatile. One of my other favorite additions is carrots and cauliflower. You can also make this with shrimp instead of chicken. My brother, Mark, LOVES Shrimp Alfredo. I made this today with pepper, carrots and frozen peas. Came out very delicious I didn’t have ingredients for sauce so i used Alfredo sauce from the store. Still very good. Thanks for sharing your recipes, again. That’s great, Helen! Thanks for letting me know. I’m glad you liked it. The combination of veggies sounds delicious. would it be ok to use chicken thighs?? You can definitely use chicken thighs in this recipe Olga. Hope you enjoy this dish. Just wanted to say thank you for this recipes, I’m doing it for my assignment as university. I will be cooking it for paying customers!! The only thing I added was carrots and changed the pasta to spinach fettuccine. I referenced you in my assignment too. Thanks again! You’re welcome, Jenna. Thank you so much for referencing me in your assignment. I’m so honored. I made this tonight. Very yummy. Love your recipes and now am actually enjoying cooking 🙂 thanks to you Olga. I’m so happy to hear that, Elena! That’s wonderful. Thanks for great recipe! I like how you add cream cheese to sauce. Are you kidding? I actually PREFER this sauce. Tastes better, like in restaurants! I’m so glad you enjoyed the sauce, Nelya. Just made this wit bruschetta 🙂 my 1 year old approves. I also added Johnny’s garlic spread seasoning from Costco cuz I barely use it, don’t want it to expire. How much pasta do you use? I love this recipe – my go to for a quick 30 min meal. And it is so versatile. I can use any veggies or protein I have on hand. My boys love it! That’s great, Olga. So happy to hear that you enjoy this recipe.